Kosmo Vinyl will visit the Rose Library for a conversation on Sept. 26 at 7 p.m. The event is open to the public at no charge. Photo by Jason Hamacher. Artist Kosmo Vinyl will join Randy Gue, curator of modern political and historical collections at the Stuart A. 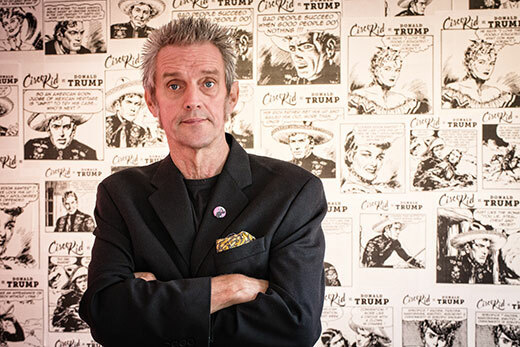 Rose Manuscript, Archives, and Rare Book Library, for a conversation about the intersection of punk, DIY culture, and art on Wednesday, Sept. 26, at 7 p.m. on Level 10 of Emory’s Woodruff Library. The event is open to the public at no charge. Due to limited space, reservations are strongly encouraged and can be made at emorylib.info/kosmo. A London-born, New York-based record producer, manager and artist, Vinyl is best known for his long association with The Clash and Ian Dury and the Blockheads. His artwork has been exhibited in Atlanta, London, Nashville and Washington, D.C., and this year one of his paintings was selected for the Royal Academy of Arts 250th Summer Exhibition.